The first article in the July 2008 PS symposium is Mitchell A. Seligson's “Human Subjects Protection and Large-N Research: When Exempt is Non-Exempt and Research is Non-Research." While it's great to have someone interested in the contradictions of IRB regulations, the absurdity of the present regime seems to have left Seligson hopelessly confused, and his incoherent essay calls for both expansion and contraction of IRB authority. Rather than trying to outline his argument, let me just list some of the questions to which he poses contradictory answers. 1. Should social science and humanities research follow the Belmont Report? Why? Why should faculty members be required to familiarize themselves with guidelines that Seligson has told us are inapplicable to their work? Does he just want company in his misery? 2. Can researchers be trusted? If this track record weren't enough, he notes that governments and universities trust political scientists to behave ethically in other aspects of their work. 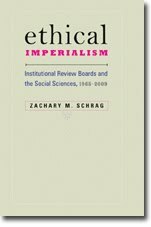 In other words, Seligson does not trust interview researchers to have the same instinctual knowledge of ethics he ascribes to survey researchers, he ignores oral historians' sixty-year record in favor of hypothetical abuses, and he assumes historians are guilty of violations of human subjects rights unless we can prove otherwise. Perhaps he wants us to get approval before grading tests as well. 3. Can IRBs be trusted? I'm willing to believe a lot of bad things about IRBs, but even I can't swallow a story like this without names and dates attached. Yet while portraying IRB officials as power-mad bureaucrats, Seligson wants to expand their jurisdiction "to cover all studies of any kind that obtain data on living humans." (482) Wouldn't that include a book about President Bush? Seligson concludes that "the roadmap to the future should be clear." Maybe it should be, but this article isn't helping. Fortunately, the other essays in the symposium are better researched and reasoned. Lest your readers come away confused by your comments, let me clarify. 1. I attempted to point out in my essay that the protection of human subjects is important and therefore I worry about the loophole created by those who claim that they are not doing research (as defined by the regulations) and as a result presumably do not need to worry about human subjects protection. So, your comment that I state that human subjects protection is “inapplicable” to what historians (and other humanists) do is not consistent with my argument. In fact, it is precisely the opposite of what I argue in my essay. 2. I also do not argue that non-social scientists should not be trusted, as you claim I do. Rather, I argue that since many humanists either explicitly or implicitly claim that they are not covered by the regulations (since they do not do “research” as formally defined in those regulations), they may be unfamiliar with them. I believe that they should be. 3. I do not state that survey researchers have “instinctual knowledge of ethics,” as you claim. Rather, the practice of survey research since its early formation has been to make survey responses anonymous. Oral historians, however, have a different tradition, and at times do indeed publish the real names of living humans they interview and the real names of others referred to in those oral histories. Therefore, it seems to me that there is a risk of harm to human subjects in calling this form of scholarship “non-research.” Personally I think it is research. The previous comment was left anonymously; I assume from the context that the author is Professor Seligson. If so, I thank him for writing. I will leave my readers to judge the persuasiveness of his essay and his intended clarifications.